A friend and former teaching colleague of mine, Patti Hardee Donnelly, is a superb photographer whose work I’ve long admired. A small offshoot of her photography has been her finding small HEARTS in many forms in nature and in life. I am often surprised, frequently amused, and always delighted by what Patti comes across in her daily life. 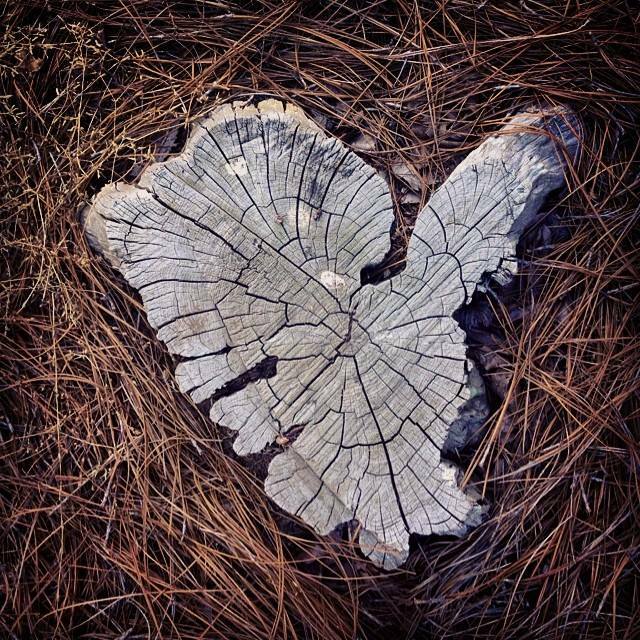 This summer she posted this beautiful picture of an old tree stump she came across very early one morning on her daily run. I was mesmerized by the beauty of it, the color and texture and most of all by the image I saw within the heart. I know that if I had been walking that path that morning, I would have totally missed this beautiful creation of nature. Thank you, Patti, for your amazing photo and talent. It immediately inspired me to write this poem, which is dedicated to you. I’ve recorded an audio of me reading this poem. To hear it, simply click on the link below. It will take a few seconds before it begins. Down to roots fastened in earth. But you found her heart. The second day of spring and the wind gusts hard. People stop and wince, cupping their ears for warmth. And it feels as if we might tumble down the street. Over our frigid heads, we stop at a Royal Mile shop. That your good felt hat is safe back at the hotel. It could happen you know. Train of thought . . .
Blueness of dusk . . .
Curtains billowing . . . Your dark self . . .
New year moon . . .
Pooh sticks . . . The sudden way . . .